Update: 2015-08-14 - Updated experimental version. This Map is on the Unreal Tournament Marketplace! Lea is a deathmatch map that is ideally suited for 2-4 players. Its compact layout and use of advanced movement systems make for competitive Duel matches and intense Deathmatch gameplay. This map is based on a design by Cedric "HTK" Morouvin. Located in the constellation Lyra, about 1,200 light years from Earth and orbiting Kepler-62, lies the blue gem known as Lea. Though tropical storms often rage on the surface, interesting aquatic life has been discovered in the depths of Lea's oceans. Pure laps, backed by funding from the Liandri Corporation, built this deep sea observatory that doubles as an Arena for the Grand Tournament. 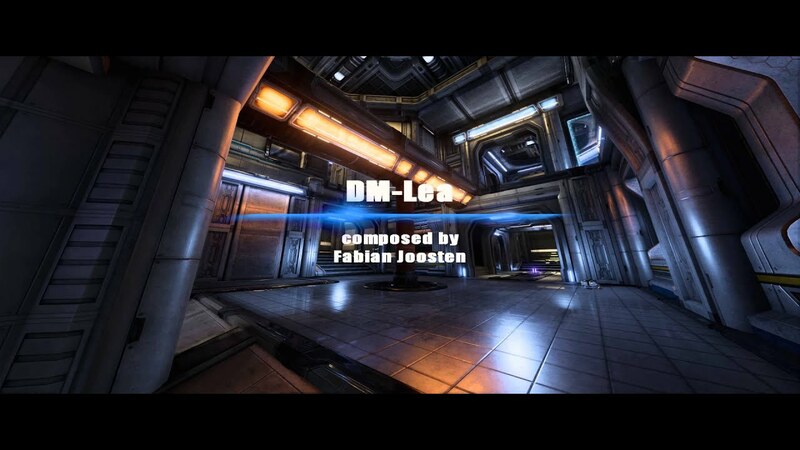 A remake of the popular UT2004 map called DM-Lea by Cedric "HTK" Morouvin. This version is based off the UT3 version of Lea, which I created in 2010. This version aims to be a completely different looking map, with very sci fi, somewhat reflective metals to take advantage of UE4’s new features, and also to test my abilities to create a great looking map that also has great gameplay. Now that Lea has been on the marketplace for many months, I figured it was time to start a brand new thread. The old one has too much discussion concerning Alpha and Beta related stuff. This thread will be concerning the current version of Lea that's on the marketplace and versions with experimental changes. I have been occasionally updating Lea with improvements, tweaks, etc. I have a new version of Lea that has drastic performance improvements, as well as gameplay improvements. I would like some feedback before it's officially submitted so that I can squash any bugs. Changed scale to 4% instead of 4.5%. Fixed a few collision issues. Scaled map 4.5% larger using Rattlesnake's awesome mapscaler blueprint script. Changed helmet near sniper into a thighpad per request. For all previous changes concerning Alpha and Beta versions of Lea, visit this thread. Community Member nonemm from #beyondunreal IRC channel on global gamers was kind enough to make custom music for my map! It sounds really great. Check it out! Epic for map feedback, polish, and much more. MasterG for helping me with texturing, materials and certain 3d modeling techniques. Also, feedback. Nonnem for the custom song! Check out his song here. Satan’s Father for helping me setup UE4 from github. Raxxy for all help concerning alpha and beta development of Lea and also help with engine related things. Dr.ToxicVenom for gameplay and art direction advice. Steve (Elude) for rock meshes in watery environment. Irridium77 - maya related advice. raste - help with lighting, cast shadows, etc. Awesome d00d! Rattlesnake - for creating the super awesome mapscaler blueprint used for scaling this map larger. Last edited by Neilz0r; 08-14-2015, 02:43 AM. Sounds great, especially keen to try the new scaling. I'm only slightly bit unsure of the removal of one health at the Vest since I often saw the more in control player staying around the Belt area and just quickly passing by Vest for pickup and the less in control player often in my eyes stayed around the Vest area since it felt a bit safer doing so, so I think possibly the health vials there benefitted more the other player not in control. A little concerned about introducing another type of force field that essentially looks the same as the one we are using but does the exact opposite. The force field idea in general is hard enough to communicate as it is but maybe you can try at least using a different alpha instead of the scan line look that our version also uses. I can't think of anything obvious that really says "only players can't pass here" without going very much on the nose and using human pictograms and whatnot. In the end going the pictogram route (icon sitting in the middle of the field with a crossed out image of either weapon or player) and unifying it all in one official blueprint would be best. That way we encourage staying consistent across levels with visual language which is important in general. Maybe for the time being a chainlink style diamond line pattern that may or may not invoke player memory of how chainlink behaved in previous games (i.e. shoot through but not pass through). I'm sure I can come up with something. The diamond style pattern you mentioned seems like a good place to start. A force field effect that informs the player that you can't pass, doesn't seem like it would be that difficult to pull off... and is probably a good idea anyway. A hair bigger, not so blue, both improvements. I don't see "drastic performance improvements", maybe a little bit but nothing very noticeable. That's on an i5 4690 and 2G GTX 960, a good midrange system, maybe it's more of an improvement on lower end machines. I don't like the new forcefield effects either. Those windows now look you should be able to jump right through them but you can't. Yet weapons fire does go through. Confusing, at least with the old grates it was clearly obvious players can't pass through and then you'd go "hmm... can I shoot between the bars?". Last edited by MoxNix; 08-12-2015, 02:50 PM. @moxnix, it seems like the biggest performance gain will be noticed on older cpus. Your i5 is much faster than my i7. Also, the higher quality your graphics, the more of a gpu toll there will be. If you play on absolute lowest graphics, sure it won't look pretty but the performance should be easily +100 Fps. Yeah I figured that might be the case, especially since you mentioned draw calls. Draw calls are more of a problem for older CPUs with lower single core performance (until the game uses DX12 all draw calls are on just one core). That's why I specified the hardware. I tested it on all Epic with Temporal AA. 110 FPS rock solid offline. Just me in the map though, no bots or other players. The old version I got 120 FPS most of the time, even online (with AA off though). With a lot of players in it would ocassionally drop as low as 90 FPS (but only very briefly). I cap FPS at 120. I do wonder why you went with 4.5% larger scale instead of say 5% which is hardly any different but would fit the grid much better... Was it because 5% broke some moves you didn't want to break and 4.5% didn't? Last edited by MoxNix; 08-12-2015, 03:24 PM. I playtested it at 5% and it felt too large.. went to 4%, it felt really nice, but just to be sure I wanted to test 4.5%. This seems to be about the sweet spot. The scaling part is a final step. I'll be keeping 2 versions of Lea, one scaled, and one without scaling. The one without scaling will be the version I make modifications to. Once the map is scaled, everything's off the grid. That's just a fact of things. That's a big reason why I converted all of the BSP to static meshes. There's no sense trying to make changes to the scaled version, when scaling it is literally a 2 click process. After having tested it I'd say the scaling felt like ever so tiny bit too large I think, previously without scaling adjustment I would argue it might be ever so tiny bit too small, for me something in-between would probably feel best. I used a SphereMask with Pixel depth to pull off the effect. 4% scale might have been the ticket, so I'll count your vote towards 4.5% being too large. Thanks for the feedback! Last edited by Neilz0r; 08-12-2015, 09:01 PM. I think that's definitely a step forward! Still potentially very confusing to people who have no idea of the functionality (where the hell did that shot just come from?) but that will always remain a learned thing to some degree plus we may solve that in a more unified manner later on regardless. Really just also needs more general player feedback. I can definitely see how newcomers would be confused. I honestly believe there isn't a perfect solution to this. You said that a pictogram might be the best way to convey at a glance info to the player. While, I agree, I think that could do more harm than good because it would be visually distracting, especially for players who are experienced and already know they can shoot through the forcefield. Lets say, hypothetically, a tutorial option were enabled for newcomers... then the pictogram would be okay, but the moment the tutorial option is disabled, the pictogram would need to disappear. Also, concerning players not knowing where certain shots came from... I can see that being an issue on an FFA map, since the player skill range is variable... but on a competitive duel map (such as lea), those types of elusive strategies are to be expected. Anywho, I'm getting ready to submit the map. Hopefully it arrives in time for the next build! Last edited by Neilz0r; 08-14-2015, 12:50 AM.